Home › Medical Services › Esophageal Disease Services › Gastroesophageal Reflux Disease (GERD) › What is GERD? Nearly a third of all Americans experience heartburn about once a month. Heartburn — also known as acid indigestion, acid reflux or gastroesophageal reflux (GER) — occurs when stomach acid backs up, or refluxes, into the esophagus, the narrow passageway that carries food to the stomach. When it occurs infrequently, acid reflux is nothing to worry about. Taking an antacid and avoiding foods that trigger the reaction can provide relief. Intense heartburn at least once or twice a week is another matter. 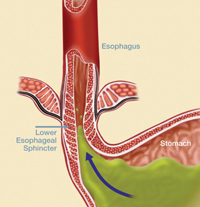 Persistent exposure to stomach acid can evolve into gastroesophageal reflux disease, or GERD. People with GERD can experience heartburn, regurgitation, vomiting and pain when swallowing. GERD usually occurs when the lower esophageal sphincter — the valve linking the esophagus and the stomach — relaxes or becomes too weak to prevent stomach contents from surging up the esophagus. 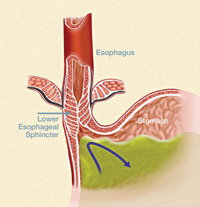 Long-term exposure to stomach acids can damage the esophageal lining, a condition called Barrett's esophagus, which is a precursor to esophageal cancer and should be treated as soon as possible. People of all ages can develop GERD, even infants and children — many of them for reasons that are unclear. Lifestyle and dietary changes, along with medications, are usually the first line of treatment. If antacids and prescription medications no longer relieve your heartburn, our UCI Health esophageal disease specialists may recommend other options, including incision-less or minimally invasive procedures. Get relief for your acid reflux. Call 888-717-4463 to schedule a consultation.